What are the Carriage requirements for GMDSS equipement as per Sea Areas ? 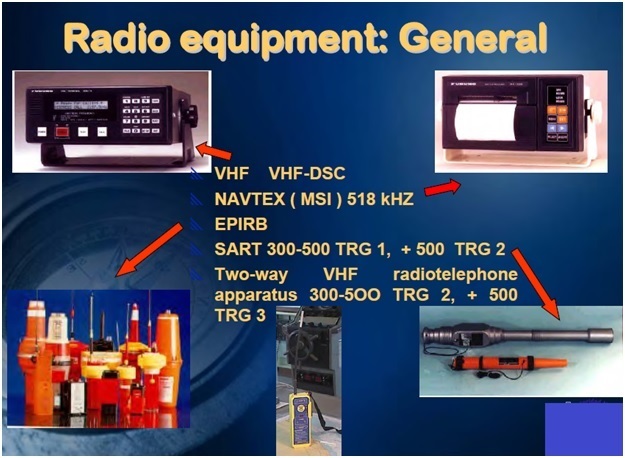 VHF DSC, VHF RT, MF/HF DSC, MF/HF RT, (*) EPIRB, SART, Portable VHF transceiver, Navtex received 518 khz, EGC receiver means (* Telex). VHF DSC/ VHF RT, MF/HF DSC, MF/HF RT, Telex, EPIRB, SART, Portable VHF Transceiver and Navtex receiver 518 kHz. List of all GMDSS Equipments as per SOLAS ? List of all Bridge Equipments as per SOLAS ? What is EIRP or Effectively Isotropic Radiated power? What are Maintenance of antenna carried out on board ? What is On load / Off load test of GMDSS ? Marinegyaan.com is not just another website; it’s a mission to create World’s Biggest Online Marine Encyclopedia for the World and to find solutions that are of extreme importance to all seafarers across the globe. Marine Gyaan Encyclopedia is a free online resource aims to document all maritime subjects and queries to replace bulky reference books. It is a benevolent reference work for Maritime community in an exhaustive manner. Our encyclopedia covers a great collection of study materials and detailed notes in subjects such as Navigation, Cargo work, Ship operation technology, Meteorology, ROR and Ship Stability etc. Searchable index include more than 2000 nautical topics in expected MMD written and oral exams with pinpoint answer, making our site a good all around tool for MMD exams preparation. The collaborative and constantly updated encyclopedia is free for everyone to use and perfect for candidate who are preparing for MMD written or oral exams such as Second mate, Chief mate or Masters. All of the entries have been written and approved by actual scholars, which means you won't have a problem when it comes time to cite sources. In addition to our massive store of reference material for fellow mariners, we are providing online bookings for various Maritime courses in maritime institutes across India.